Markets across the globe took a knock on Wednesday amid a US squabble over continued stimulus spending, which dominated a meeting of the US Federal Reserve. The plunge has raised concerns of a recurrence of the 2008 crash. The Dow Jones index went down by 0.8% and lost 108.13 points. The S&P 500 shed 1.2%, or 18.99 points, slipping from highs it last reached in October 2007. After closing at a 12-year high on Tuesday, the Nasdaq Composite slid by -1.53% and lost 49.19 points. Markets had been reacting positively with better-than-anticipated earnings and a short-term US fiscal deal reached in early January. The Wednesday dive is yet another reaction to the news from the Federal Reserve. Now the Fed might end quantitative easing the markets are worried its removal might be too broad and too fast. However, potential changes to the Fed’s monetary policy are “less bothersome than some things on the horizon,” Art Hogan, market strategist at Lazard Capital Markets told MarketWatch.com, listing the March 1 deadline for cuts in government spending, known as sequestration, and the outcome of the upcoming Italian elections. Russian markets reacted immediately as investors started unloading shares in Russian companies. As a result the main Russian indices traded in the negative territory throughout Wednesday. An hour before closing, the MICEX is down by 1.16%, losing 17.48 points, and the RTS is lower by 2.12%, or 33.41 points. For Russia, the main risk is when the markets plunge the euro loses value, while the US dollar gains ground, leading to the rouble in turn losing value too, Yaroslav Lissovolik, chief economist at Deutsche Bank told RT. “This is an impulse for capital outflow from Russia. Also, prices for crude oil go down. Investors’ appetite for risks weakens. I expect that the situation in the US will be a key risk factor for Russia and for the world markets during all of 2013. Although the Russian market is likely to moderately grow this year, the United States will be a deterrent,” Lissovolik said. The side effect of the Fed’s hint at earlier stimulus withdrawal reached European stocks as well. As of 9.30 AM EST Germany’s DAX is lower by 137 points, or 1.77%, France’s CAC 40 loses 69 points, or 1.88% and London’s FTSE 100 is leading the downhill by sliding 100 points, or 1.57%. 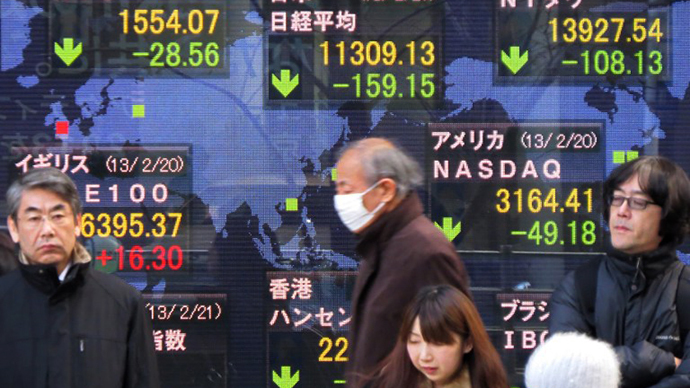 Asian markets also finished sharply lower on Thursday. The Shanghai Composite went down 2.97% while Hong Kong's Hang Seng was off 1.72% and Japan's Nikkei 225 slid by 1.39%. European oil prices have dropped below US$94 a barrel on Thursday after the news of US Federal Reserve officials’ dissatisfaction with the current super-easy monetary policy and the upcoming release of the report, expected to show a rise in American crude inventories. The benchmark crude for April delivery was $93.78 a barrel in electronic trading on the New York Mercantile Exchange, dropping $1.44 compared to Wednesday’s price. Prices have also decreased in the US and Asia, reaching the mark of $94.65 a barrel. The dynamics and attitude within the world stock exchanges have led some experts to recall the events of five years ago. Back then, in 2008 “markets were partying like there was no tomorrow -- ignoring the bubbles that had developed, having failed to learn lessons from the plethora of previous financial crises, and pretending that if they just kept saying everything was fine long enough, everything would indeed be just fine,” Daniel Wagner, CEO at Country Risk Solutions wrote in his article for the Huffington Post. In his article, published on Wednesday, Wagner warned that high global unemployment rates and ongoing fiscal anxiety are taking their toll and if measures are not taken to address them, another wave of financial gridlock is just around the corner. Wall Street is starting to pay attention, but only after the stock markets reached a post-2007 high last week, Mr Wagner warns in the article.